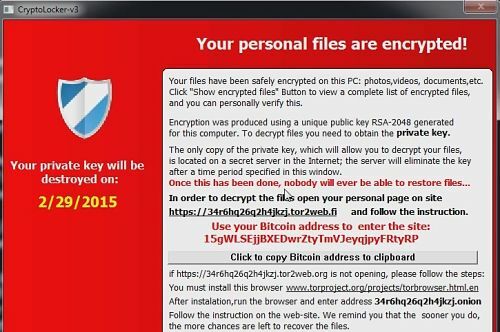 This is a “sister” virus to at least two other known entities: Alpha Crypt and Cryptolocker-V3. They operate in practically the same way, however each uses a different encryption method, so they are listed separately. Despite what the picture claims, the code generated is not unique for your PC. Do not be fooled. These people are just trying to extort and take advantage of the fact you’re probably not knowledgeable with these things. TeslaCrypt is not special in any particular way. The supposedly unique RSA-2048 key that can not be replaced (at least the message says so) is already researched. In fact, in the removal section below, we will post a link for a TeslaCrypt-specific decryptor that should theoretically restore all your files. Theoretically because there are always newer and updated versions of Ransomware, and there’s no way which one exactly you were infected with. Encryption was made using a unique strongest RSA-2048 public key generated for this computer. To decrypt files you need to acquire the private key. server in the Internet; the server will eliminate the key after a time period specified in this window. WARNING! TeslaCrypt adds extensions called .ECC and .EXX to your files. If you are seeing extensions with the .EZZ appendix, you are likely suffering from Alpha Crypt, which uses an entirely different method for encryption. Check out our other removal guide for Alpha Crypt. 5. Click the windows button then type regedit in the search field. I’ve read your article and it is very informative, you sound like experts on the matter. Am hoping you can help me with my Malware issue. On 5-22-15 my computer was attacked by what I believe to be Teslacrypt Malware, all of my files were encrypted and have a .exx file extension. From what I understand I need a unique decryption key specific to my encryption, but am very stuck as with how to go about the decryption process or how to access/locate this unique decryption key. Am willing to pay the ransom, but at this point, that no longer seems to be an option. Any help you can offer me is greatly appreciated. I somehow missed your comment. Have you resolved your situation or you still need help? If so, please leave another comment and we’ll think of something to help you. Thank you for responding to my comment on my malware encryption issue, I missed your reply as well. Have not resolved my situation, but am slowly understanding more about what happened to my files. Any suggestions you have would be greatly appreciated. My email is [email protected]. So hopefully we can communicate easier in the future. If you can not restore to a previous date, then unfortunately, there is no solution for the encryption – at least for the time being. Researchers are trying to crack the code, but there’s not timetable for when anyone can expect them to succeed.